Born in 1892, Alvan Cleveland Kincaid grew up in Orleans, Indiana. He completed his schooling and graduated from Franklin College in 1915. Kincaid enrolled in the military shortly after. Kincaid’s first military experience when he was assigned as a First Lieutenant in the 336th Infantry, stationed in the United States. His military experiences broadened from national to world wide forces. He had assignments in France, the Panama Canal Zone, and other countries while on duty. He fulfilled many ranks, but held titles as a command pilot, combat observer, and aircraft observer. During his years of service, Kincaid received many awards. These included the Distinguished Service Medal, Legion of Merit, Commendation Ribbon, Silver Star, Bronze Star Medal, and a Purple Heart. Kincaid also received awards from many foreign countries. Even though, Kincaid was a General, he had an outstanding reputation for always being kind and thoughtful. An account from Major General Earl L. Johnson shows this. Johnson says that Kincaid invited him over for dinner on Christmas Eve when Kincaid was the Commanding General for the 20th Air Force in 1948. Kincaid had no obligation to invite him to dinner; but, he did so knowing that Johnson would be alone. This was not only a very generous offer, but also a great opportunity to meet with the other Generals and get to know them on a casual level. General Kincaid also had a nick name in the force. His initials were A. C. K., and he became known as “Ack-Ack” Kincaid. He embraced the nickname, which not all Generals would do. After he left the military, Kincaid spent most of his free time playing golf. Kincaid passed on January 15, 1986. He is buried in the Arlington National Cemetery. His tomb is located in section 6, site 5474-E.
Patterson, Michael Robert. 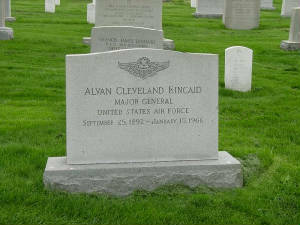 “Alvan Cleveland Kincaid Major General, United States Air Force.” Arlington National Cemetery Website. 20 June 2007.